Darth Vader and Boba Fett invite you to visit Cloud City. Poster-style artwork inspired by The Empire Strikes Back. 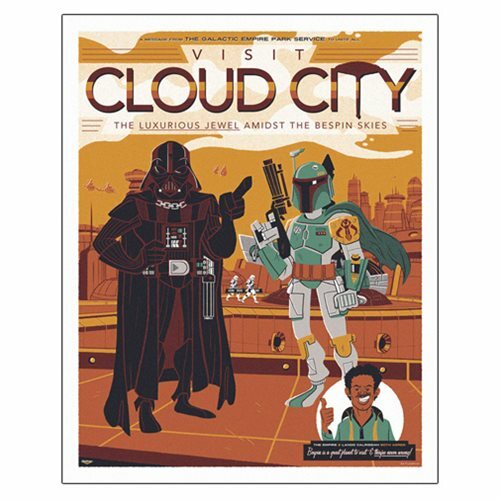 Darth Vader and Boba Fett invite you to "Visit Cloud City - The Luxurious Jewel Amidst the Bespin Skies" in this poster-style Star Wars Visit Cloud City by Ian Glaubinger Lithograph Art Print. Visit Cloud City by Ian Glaubinger features artwork inspired by The Empire Strikes Back. An unframed limited edition of only 150 hand-numbered pieces, it measures 20-inches tall x 16-inches wide. Each lithograph print comes with a certificate of authenticity. Here's a message to you from The Galactic Empire Park Service to unite all: "Visit Cloud City - The Luxurious Jewel Amidst the Bespin Skies." The Empire and Lando Calrissian agree that Bespin is a great planet to visit… and they're never wrong!